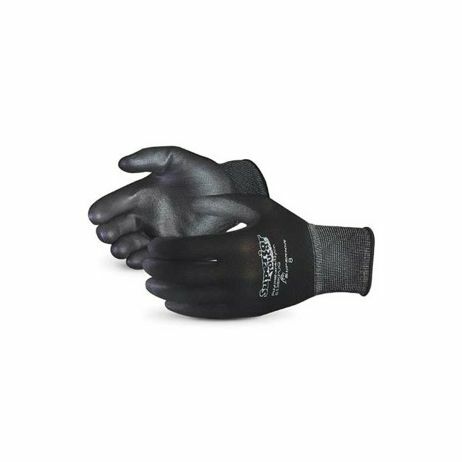 Superior ® Supertouch ™ Black Nylon Glove with Polyurethane Palm Coating SOLD DOZEN Puncture resistant level 1. Polyurethane offers great stretch, softness, as well as low particulate shed.The polyurethane coating provides a grip without feeling sticky, which also eliminates the need for finishing preocesses to reduce tackiness. 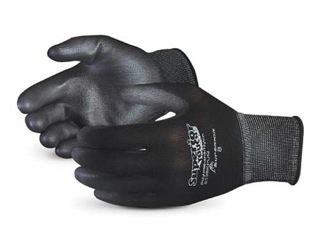 Low particulate shed makes the glove idea for working with electronics or in a clean room. Other uses include automotive small parts handling, and food handling.